At first Florence tries to hide Mocha in her bedroom, but mom finds out in no time. After that she boycotts her parents' posters in search for Mocha's owner. She changes the phone number, and even draws eyeglasses and a mustache in Mocha's picture in order to disguise him. But despite all her efforts Leon appears one day at Florence's door looking for his dog, and he is nothing like her imagined he would be. He is not a despicable person who frightens Mocha away. He is actually a sweet old man happy to find his dog, and Mocha evidently loves him. What is Florence suppose to do now? Loving story which crushes your heart, but finally leaves you with a big smile in your face. Florence is like any other kid, and her feelings are the main theme in this book. She goes from hopeful to happy, and from nervous to sad, and even confused and guilty. The illustrations are gorgeous, with an ideal balance between white and color, and focused in all those feelings and in Florence and Mocha relationship. 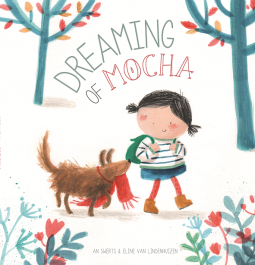 Dreaming of Mocha is a book made for read and reread.